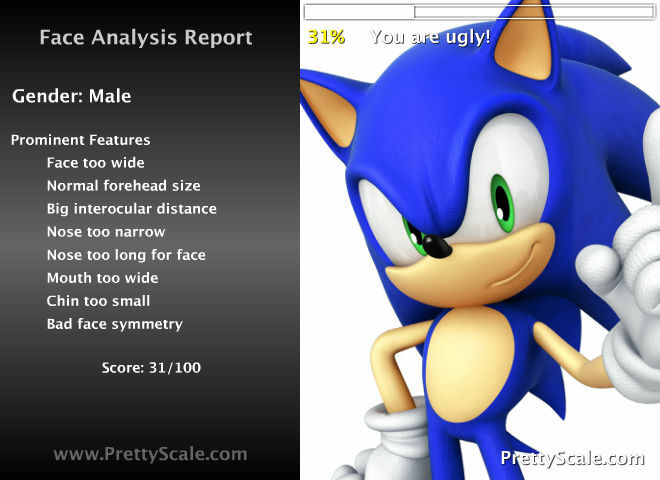 There's a lot that can be said about the uglier aspects of video game culture. And today, I'm going to skate right over any such issues and instead ask, "Who is the prettiest princess in gaming?" 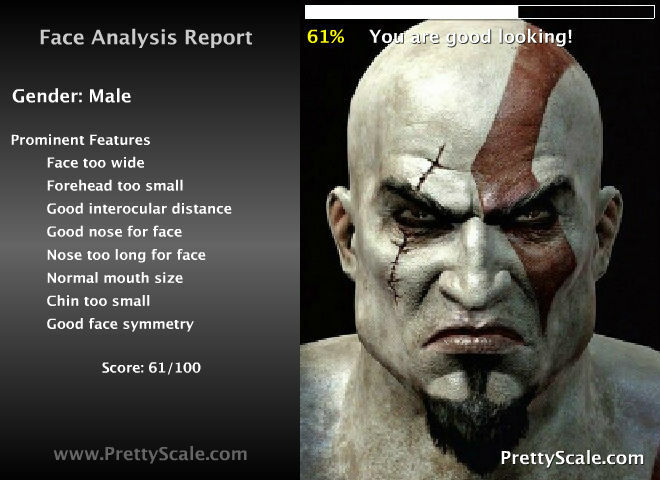 I'll be failing to answer even this massively frivolous question with the help of the face analysis tool at Prettyscale.com. The highly scientific app will take the face of any subject and quantify their attractiveness, assigning them a percentage rating and also summarizing their looks in a few words. So without further ado, let's get analyzing. For science! 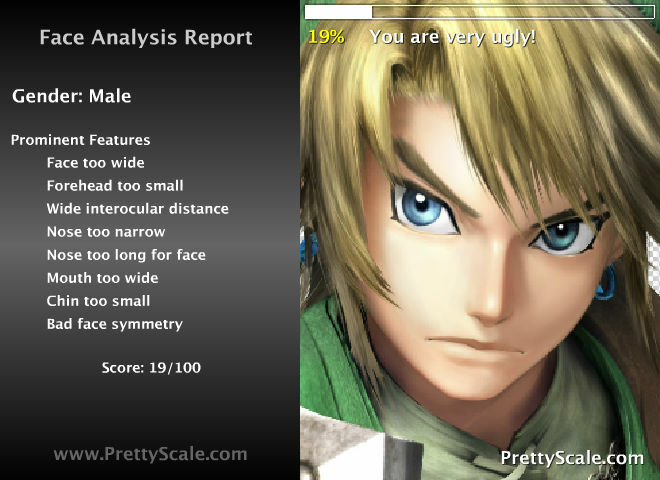 Pretty boy Link turns out to be not so pretty after at all, breaking the hearts of a million Legend of Zelda fans. 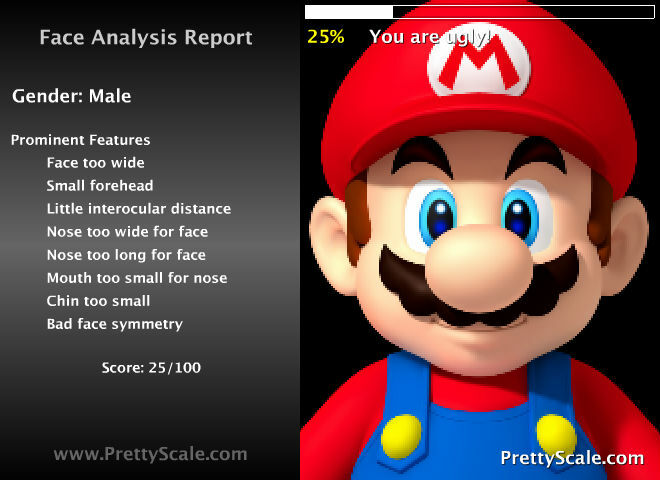 Strangely, while PrettyScale.com dings Link for his wide face, narrow nose and tiny chin, and the distance between his eyes, it fails to mention just how terrifyingly massive his peepers are. He may not be a pretty boy, but who needs looks when you're such a Cool Dude (TM) and a shoo-in for membership of the Royal Guard. 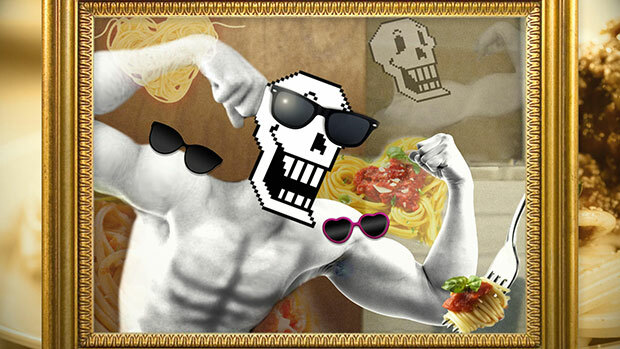 Also a dab hand with spaghetti, but it's probably best not to watch him eat it. 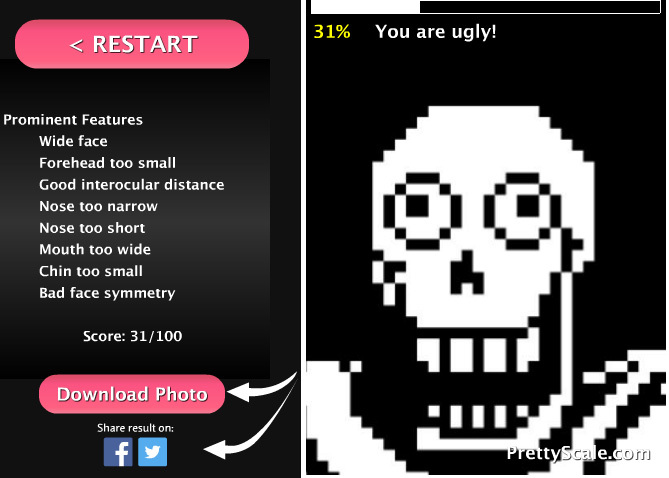 Glad to see Prettyscale.com's face analysis robot pick up on the shortness of his nose (short, as in, "entirely absent"). 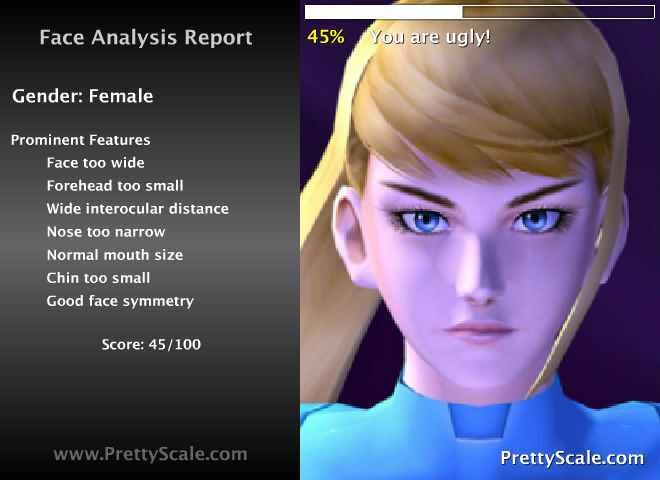 Samus scrapes in with 45%, being labeled "ugly" by the face analysis bot. This might seem unfair, especially given how many fans she has. But it all makes sense when you remember the hidden extra ending of the original Metroid where she peeled back her skin to reveal she was just several Metroids crammed into a corpse. 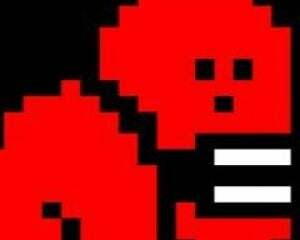 Outdoing Samus in the attractiveness stakes is L-Shaped block from Tetris. Hailing from Russia, it's rumoured this gaming stalwart will happily fill any gaps you have. Though a side-effect is that cross-section of your torso and internal organs will disappear, which may prove problematic. Crossing over from "ugly" into "not bad," we have Mileena, with her penchant for edged weapons and higher-than-average dental bills. Though Mileena's forehead may be fair game, I can't agree with the analysis of her mouth as being too small. 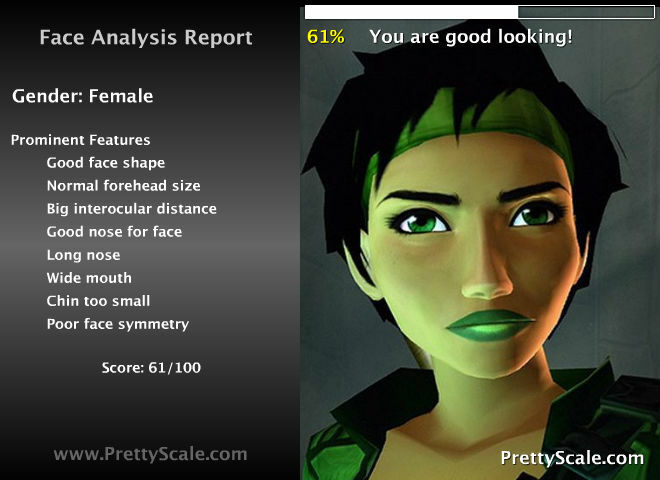 No relation to Mileena's sister-in-arms, Jade is at number three as we cross over into "good looking" territory. She has a fondness for green lipstick, headbands, and bacon sandwiches. Though she hasn't left her house for thirteen years and neighbours are complaining that the milk bottles are starting to pile up. 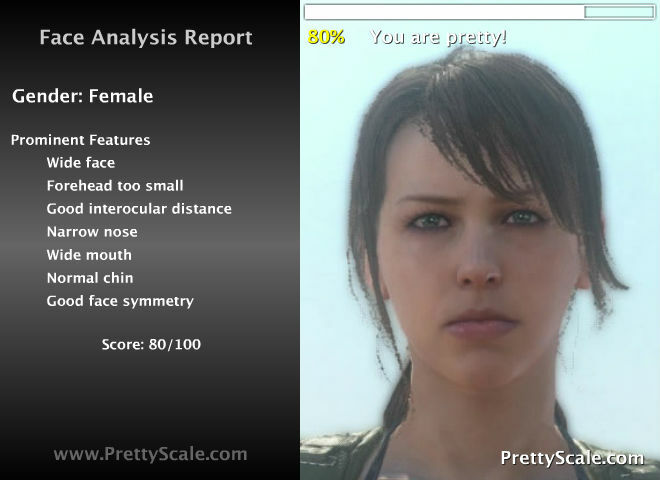 Cynics may say that Quiet has won by virtue of having the most realistic-looking face out of all our other entrants, but I say pshaw! to such unfair criticism. She is just a beautiful, beautiful woman who happens to wear a bikini top because all other clothes have been eaten by rogue moths. And she breathes through her arse. Well, that brings this pretty-off to a close. 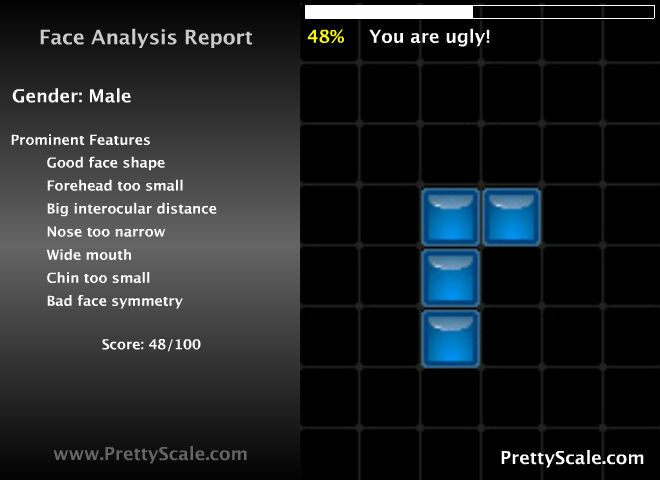 Thanks to Prettyscale.com for providing in-depth analysis of our participants' attractiveness. Coming soon... Pretty-Off: Tournament Edition. Probably. Honest.